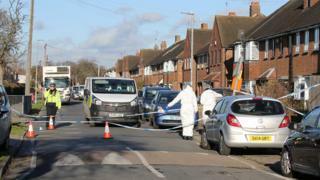 A murder inquiry has opened after a 15-year-old boy died in a suspected stabbing in Hertfordshire. The boy was pronounced dead after emergency services were called out to Hurst Drive, Waltham Cross, at 21:30 GMT on Thursday. The victim was treated by paramedics, but died at the scene. Hertfordshire Police said it was working with the support of the boy's family to establish the circumstances around his death.